* The Elfschool is open all year around in Reykjavik. The school is 32 years old this year. What students in the Elfschool gain and learn is everything that is known about elves and hidden people, as well as gnomes, dwarfs, fairies, trolls, mountain spirits as well as other nature spirits and mythical beings in Iceland and in other countries. And also where these creatures live, what they look like, their ideas about humans, about them as well as all the other nature spirits that seems to live around us here in other dimensions – as the elves themselves claim that they live in. * The students in The Elfschool learn also about hundreds of Icelanders that have had personal contact with the elves themselves, and many of them have been invited into the homes of the elves and the hidden people in Iceland, and have often eaten food there and sometimes also slept there during one or more nights. – The argument that the elves and Hidden people of Iceland have saved hundreds of lives of Icelanders through the centuries is explored and explained to the students, as well as how this strange friendship between these two or many different worlds and dimensions can and does exists. * Students learn also many other interesting and sometimes practical things about these beings as well as all this strange phenomenon in general. After the session students can get a private walking-guide to one of the main elf places in Reykjavik (it is about 900 meters away from the school). We charge just 19€ / 24$ for each person for such extra guide after the Elfschool-sessions. There students are told events that took place there in the past, both involving a confrontation as well as a friendship between the humans and the elves some years and decades ago there. For visiting this place students have to book that in advance so the timeplan of the school can fit to it. – The walking guide normally takes about 25 – 30 minutes, as is usually after the school-session, about 19:00. * The school is based on two major lectures, by the Headmaster of the school, Mr. Magnus Skarphedinsson, (1955-) whom studied History at the Icelandic University 1985 – 1989, and also Folklore and Anthropology some years later at the same University. He has explored a lot of research concerning elves and hidden people and other nature spirits for more than fourty one years now in many countries in the world. He has met personally more than 900 Icelanders that have seen and met and talked with elves and hidden people in Iceland or have had a long friendship with them, – and met more than 500 foreigners in these 40 countries he has done researches in also. 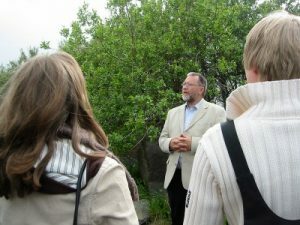 Mr. Skarphedinsson is also one of the leader of the Paranormal Foundation of Iceland. – All the lectures in the Elfschool are in English. The schoolfee is just 56€/64$ per student, and everything is included in that little payment; – The 70 pages studybook in English (or German or Swedish), – the coffee or tea, – the best bread in the country, – and pancakes with jam and wipped-cream for thouse that like that. – For all further information about prices, discounts and special arrangements (a special Elfclass, a private class on other day than Fridays, for you and your group), see in “Prices and schedules”, in Special sessions – and prices for that and also in Prices and discounts. – The only thing that we can promise you and most or all other students in the Elfschool is the fact that the Elfschool-day is normally the day that most students never forget for a very long time. * You can either buy the Studybook through the postservice, – or simply if you are in Iceland, then drop by at the Elfschool itself, here in Sidumuli 31, (2nd floor), – 108 Reykjavik. ICELAND, – and get it yourself! – But give us a call or and send us an email first if you can. * The price of the Studybook is just 25€, or 32$. – For postage and handling is just 16€, or 21$. – So to get the Studybook by the postservice send us either 41€ or 53$, – and we will send you the Studybook the same day from here through the post, when we have received a confirmation from the bank about your intention and moneytransfer.